Lesson 5: Are Our Shadows Long? SUNBEATABLES® PARENTS: Take photos of the students and their shadows during the lesson and post the pictures on your school’s website or email the photos to parents with a summary of the lesson. Note: This lesson works best on a sunny day. Take students outside in the morning (before 10:00 AM). Note: You can also take students out in the late afternoon (after 4:00 PM) if participating in an after-school program or activity. Explain to students that the sun’s rays are most harmful when the sun is high in the sky and directly overhead. Pair/group the students and ask them to find their shadows. 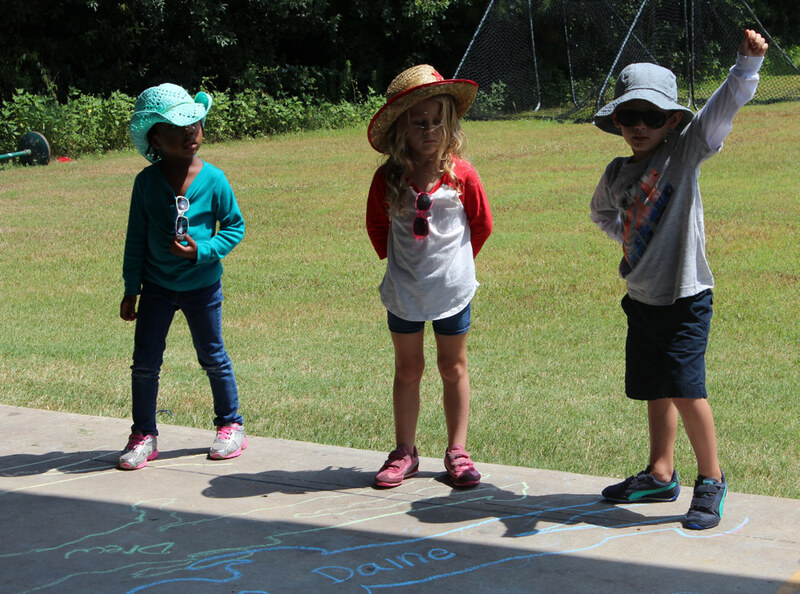 Ask one student to stand still or hold a fun pose while another traces his/her shadow with sidewalk chalk. Then, ask the students to switch tasks. You may need to help them trace their shadows. Note: Instead of using sidewalk chalk to trace the shadows, you can use butcher paper and markers/crayons. Provide each student with a piece of butcher paper. The paper should be longer than the student’s height. Follow the same directions provided in the lesson, but use markers/crayons instead of sidewalk chalk. Ask each student to label their shadow with their name and time of day. Repeat the steps above at midday. Ask students to draw over existing shadow outlines using different colors, so they can compare their different shadow lengths. Note: Be sure students stand in the same spot (labeled with their name) as they did earlier in the lesson to compare their shadows. There will be little or no shadow at 12:00 PM. There will be longer shadows before 10:00 AM and after 4:00 PM, in opposite directions as the sun rises and sets. During and after the lesson, discuss with students what their shadows look like. Ask each student to stand still and step on one end of the string. Then, run the string along the student’s shadow and cut the string at the top of the student’s shadow. Using a yardstick or measuring tape, ask students to measure the length of string. Fold a piece of tape in half across one end of the string (it should look like a flag). Label the string with the student’s name and time of day. To conduct the lesson indoors on a cloudy or overcast day when shadows are not as visible, use a flashlight and a standing object. Tell the students that the flashlight represents the sun. Shine the flashlight against the side of the object, so that the object’s shadow appears long (see Photo 1). Explain to students that our shadows are longer in the early morning or late afternoon, when the sun is rising or setting. Then, hold the flashlight directly over the object, so that the object’s shadow appears short (see Photo 2). Explain to students that our shadows are shortest during peak sun hours, when the sun is directly overhead. Encourage students to take turns repeating the activity on their own, and to “teach” the class why the shadow cast by the flashlight is long or short. Note: While this adaptation can be used on cloudy days, it is recommended that you repeat this lesson with chalk, markers/crayons and/or string outside on a sunny day to help students learn more about their shadows. Kindergarten Using a piece of string or yarn, ask students to measure the length of their shadow in the morning. Repeat this in the afternoon with another piece of string or yarn. Ask students to compare their two pieces of string or yarn. Ask students to discuss the difference in their shadow measurements. Give each student a piece of construction paper and ask them to draw a clock. 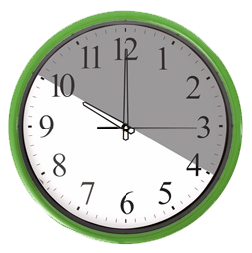 Ask students to number the hours on the clock, and draw lines pointing to 10 o’clock and 4 o’clock. Then, ask students to shade in the area between the lines. Ask them to count the number of hours between 10 o’clock and 4 o’clock. Remind students to be SUPER-protected and use all of the sun safety superpowers during this time. 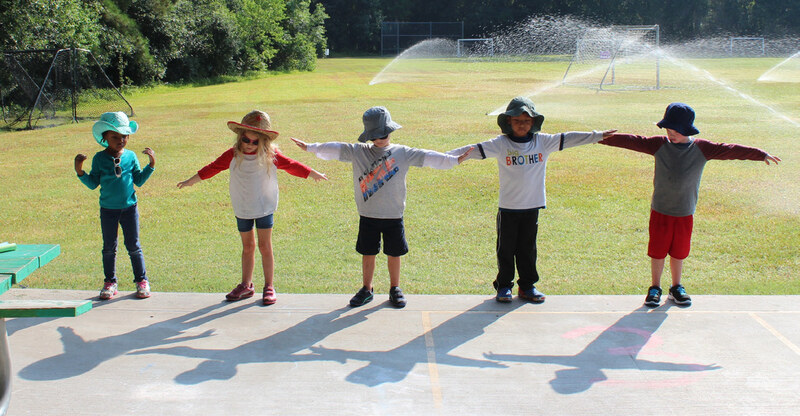 Once outside, ask students to stand still and “find” their shadows. Then, ask students to do jumping jacks, raise their arms up and down, bend their knees up and down or jog in place. Students can watch how their shadows move with them. Remind students that shadows form when an object, such as the human body, blocks light, such as from the sun. SING A SUN SAFETY SONG! Sing along to a Sun Safety Song by downloading them or streaming from the player below. 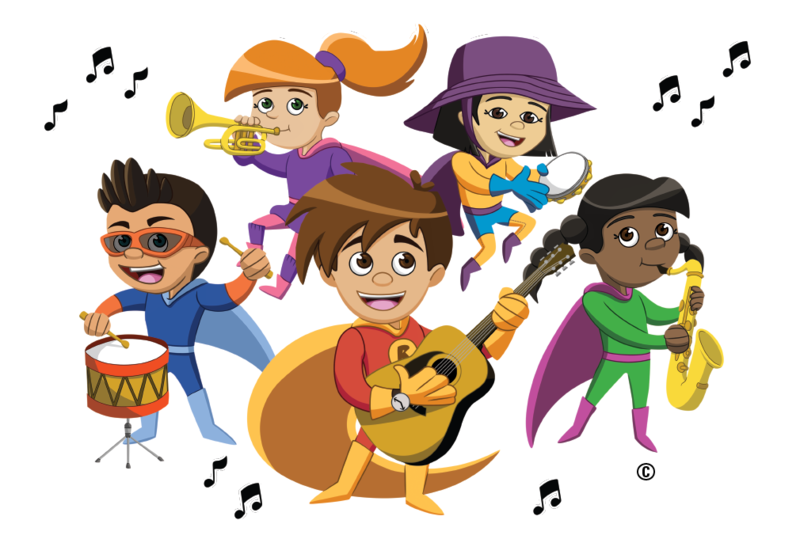 Ask students to act out the song and role model sun safety behaviors.